"Messenger for WeChat™" aims to make web.wechat.com access easier by providing panel view in Firefox browser and sandboxed window in Chrome browser. In Chrome version the application is loaded in an isolated window and hence has no interaction with your browser. In Firefox version though, the web.wechat.com is loaded inside the browser panel view for being easily accessed. Please note that the sole purpose of this application is to make WeChat access easier, there is no intention on misleading anyone to think this is the official application. What is the "Messenger for WeChat™" add-on and how can I use it? The idea behind this add-on is to provide an easier way to access the popular WeChat messenger. Normally you have to open the UI in a browser tab which usually distracts your current work. Using this application, access to the official application would be possible without the need to switch tabs. Note that this application only provide an easier way to access the official user interface of WeChat web, and does not interact nor collect any data from user. Before using WeChat messenger, you need to take a look at the WeChat - Terms of Service documentation. What is the meaning of the badge icon (Firefox only feature)? The badge displays the total number of unread conversations you have in your list. This number is equivalent to the number shown in the title bar when web.wechat.com is loaded in a browser tab. WeChat web can ONLY operate if you already have the official WeChat messenger on your cellphone. 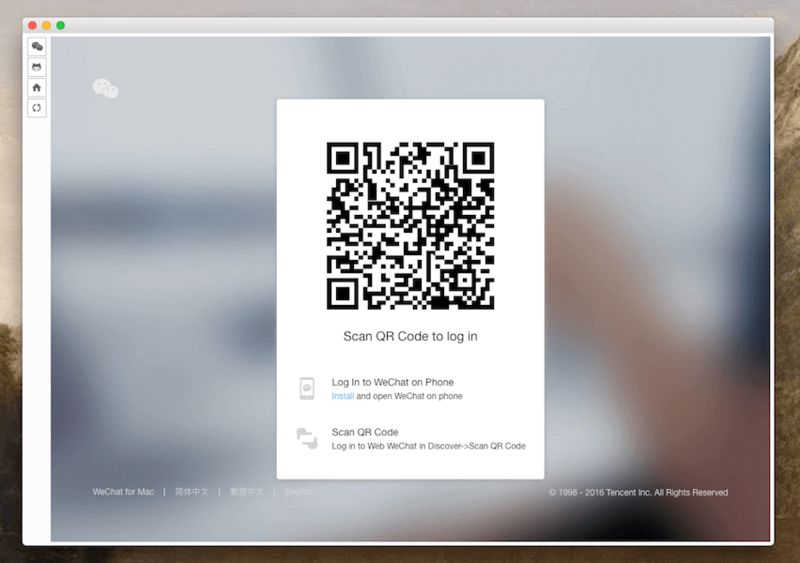 After the first installation, open the toolbar panel in Firefox or open the sandboxed window in Chrome from chrome://apps/ and wait for a QR code to be generated. Now open your WeChat client in your cellphone and click on the "+" button and select scan QR code. After the code is scanned, a confirmation is shown on your mobile set and by privileging the the client, all your conversations will be displayed in the desktop version. For more info please take a look at WeChat on Your Desktop: We've Already Got You Covered blog post. Can I modify the location of the toolbar button in the Firefox version? Yes, Firefox allows you to change the toolbar position to fit your needs. Take a look at a Comprehensive Guide to Firefox Customization blog post for more info on how to customize the location. Open the toolbar panel. In the left side, there is a refresh button. Press the button and wait for a few seconds for the badge to calculate the number of unread conversations. If refreshing didn't help you, please open a new conversation in the support section of this page. You can open WhatsApp web, FAQs page or the bug reporter directly from the panel. Also you can refresh the panel. If you need a new feature post a bug report and I'll try to add this it in the next release.